With more states legalizing recreational and medical marijuana, you as an employer should be aware of your rights and obligations when it comes to employee use of marijuana. Vigilant’s experienced legal team knows all about the workplace implications of marijuana laws that affect employers in Oregon, Washington, California and Idaho. This Legal Guide gives you an overview of federal and state marijuana laws, and offers guidelines on how to handle the workplace issues associated with marijuana use. Choosing to accommodate marijuana use, or not. Understand the implications of choosing to accommodate marijuana use, or not, and the state laws in Oregon, Washington, and California that come in to play. My employee tested positive for marijuana use; can I terminate the employee? Learn more about where and when you can fire workers who test positive for marijuana or Marinol®, a synthetic THC compound prescribed by doctors. Medical marijuana and the intersection of FMLA and ADA. Know the laws and what your obligations are as an employer when medical marijuana intersects with FMLA and ADA. Not sure whether you can test for drugs during the hiring process? Is your business located in a state where medical marijuana is legal, and you don’t know what you can and cannot prohibit? Do you want to give your employees flexibility without compromising safety? Vigilant is here to help. Because interpretations and enforcement of marijuana laws can change, make sure your policies are up to date with our Marijuana in the Workplace Legal Guide. 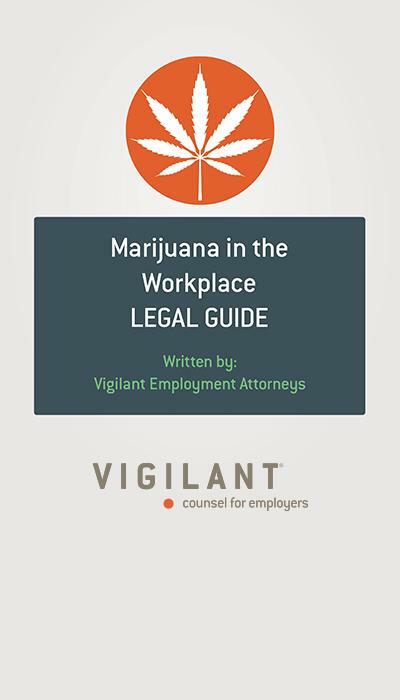 Fill out the form above to receive a free digital copy of our Marijuana in the Workplace Legal Guide document and also receive Vigilant’s employment law and HR updates. You will receive an email with a link to the document. Want to learn more about marijuana in the workplace?